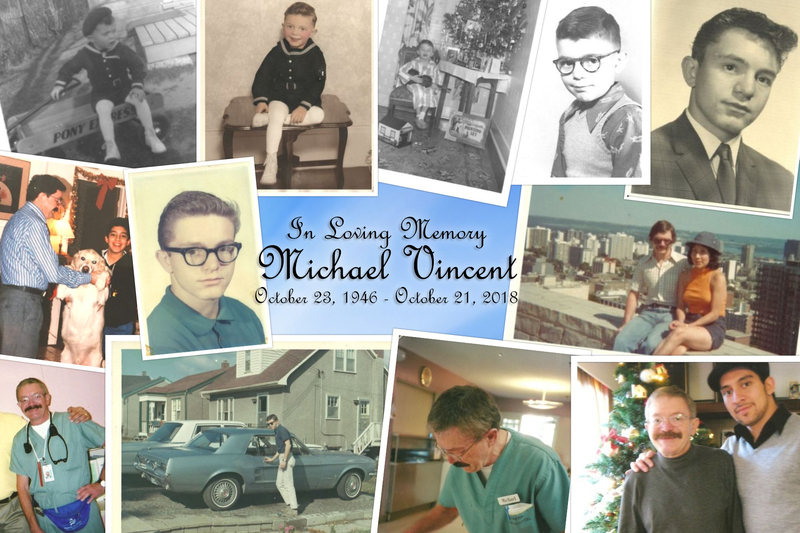 Michael Joseph Vincent, 71, passed away on Sunday, October 21 at the Royal Jubilee Hospital in Victoria, BC surrounded by his loving family. Michael was born in Ottawa on October 23, 1946. He grew up in Almonte, and later moved to Sudbury, Toronto, and eventually settled in Victoria. In 1978, he married his wife Linda Mariella Eras Dias. They had their son Paul on April 26, 1982. Michael was known for his sense of humour, his thirst for knowledge, and youthful sense of enthusiasm. Michael was always up for a road trip or willing to trying something new. Those who knew Michael knew that he loved his job as a Respiratory Therapist, and he would engage in discussions about health care whenever the opportunity arose. Michael’s passion for his career brought him all over the country and to the United States for work. Michael was also known for his love of dogs, and adored our four-legged member of the family “Butch”. Michael is survived by his wife Linda of 40 years, son Paul and daughter Laurie (from a previous marriage). He will be remembered for being a loving husband and father. Special thanks to everyone at the RJH Kidney Centre for taking great care of Michael over the last 10 months, and to Pacific Coast Cremation for helping through this difficult time.